Just last month, we published a blog describing how government messages on reduced risk products are not getting through to the NHS. You can read the whole thing here but this was the summation. We are in the second decade of the 21st century but NHS trusts seem to be stuck in the past and not yet caught up on where the government is going. If NHS England truly seeks to reduce smoking by any means, it should be more imaginative in its approach and, if nothing else, at least listen to the messages coming from government and its institutions. This week, we were also contacted by the Daily Express about new research that revealed only a pitiful 7% of GPs felt confident enough to recommend e-cigarettes to smokers who present themselves to surgery. The NNA was quoted in the article. It’s official – electronic cigarettes are now the most popular way to quit. And when electronic cigarettes are combined with advice and support from stop smoking services, incredible quit rates are achieved. Unfortunately, the most effective way to quit smoking is highly underused. In 2016/17 just 4% of people using stop smoking services were also using electronic cigarettes. That could be about to change. Public Health England is challenging stop smoking services to offer vaping devices, and we’re seeing an increased number of enquiries from services, local housing associations, mental health organisations and more looking to offer electronic cigarettes to their users. Imagine jailing people for helping someone give up smoking. Imagine thinking that prohibition works. This is an incredibly stupid and harmful idea. I’m particularly annoyed by it because I would like to visit Hong Kong one day. Across the country, school officials are engaged in what appears to be a kind of collective insanity over student vaping. Schools are holding emergency student assemblies and meetings with parents where often-shocking misinformation is distributed. Principals are sending letters to students’ homes filled with horrific hyperbole about popcorn lung and nicotine addiction. Some schools are removing the doors from restrooms to reduce illicit vaping. And in some cases, students caught vaping are even being turned over to the policefor criminal prosecution. This morning, outgoing FDA Commissioner Scott Gottlieb issued a press announcement on a “potential safety issue” relating to vaping products and seizures. 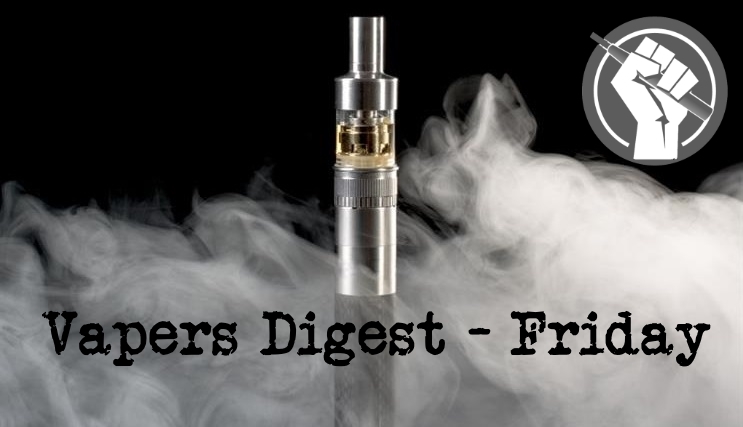 According to the FDA, over the last nine years, 35 seizures have reported to the FDA’s Adverse Event Reporting System (AERS) by the doctors of individuals who reported that they vaped at some point prior to suffering a seizure or convulsion. The Harm Reduction Journal has published a behavioural study looking the reasons for using a JUUL device. The results showed JUULs, flavours, and other factors were good at predicting past 30-day abstinence from cigarette smoking. JUUL Labs commissioned and funded the Centre for Substance Use Research (CSUR) to independently design and administer the survey. People were invited to participate in this study through email invitations and inserts in JUUL starter kits. The research was conducted in the United States where there has been vitriolic opposition to tobacco harm reduction and vaping. Scott Gottlieb is spending his remaining hours as commissioner of the Food and Drug Administration (FDA) launching a new volley of lies and smears at tobacco harm reduction. In a desperately gutless and immoral manner, Gottlieb ignores reason and evidence to accuse vaping of potentially triggering seizures in teenagers. “We know that nicotine isn’t a harmless substance, especially in the developing brains of our youth,” says the FDA press release. A single rodent study is all Gottlieb has to support this claim. The use of electronic cigarettes by young people needs to be addressed. However, taxes are an ineffective measure for deterring youth e-cigarette use. Moreover, excise taxes are typically used by lawmakers to discourage the use of dangerous products and should not be applied to tobacco harm reduction products. Even as the Food and Drug Administration (FDA) seems poised to continue cracking down on e-cigarettes and vaping as alternatives to smoking, the agency might be loosening its hardline stance on another nicotine product. That’s good news for public health, and something that the next FDA commissioner should encourage. You might have more in common with anti-vaxxers than you want to believe. You might feel the need to reject the possibility because you would never maintain a belief so obviously out of touch with the facts. All the evidence points to the fact that vaccines don’t cause chronic disease and that any risk vaccination does have is worth taking to prevent the spread of deadly infectious diseases. Anti-vaxxers know all this, but it doesn’t change their minds. Maybe you think this is because they are dumb. But, anti-vaxxers aren’t stupid: they’re scared. Since 2015, the survey has also asked about youth vaping. The latest results found that only 1.8% of students use e-cigarettes or vape daily. A slight decrease from 1.9% in 2017. Less than 0.5% of students who had never smoked vape daily. The number of cigarette smokers in the UAE is on the decline as global sales of vaping products get set to rise sharply, a Dubai conference has heard. An expert told the World Tobacco Middle East event that cigarette sales now account for less than 90 per cent of the tobacco industry. Ivan Genov, a drinks and tobacco analyst at Euromonitor International, said growth in the industry will be “difficult” in the years to come. Surveys show that the majority of the millions of Americans who smoke want to quit. With cigarette use continuing to be the leading cause of preventable death in the United States, exchanging cigarettes for electronic cigarettes—or e-cigarettes—could go a long way toward reversing this fatal trend. But one scholar argues that the U.S. Food and Drug Administration’s (FDA) regulations keep smokers from learning about e-cigarettes’ harm-reducing potential. In a recent paper, Jonathan H. Adler, a professor at Case Western Reserve University School of Law, calls e-cigarettes “the most promising smoking alternative to enter the market to date.” Many varieties of nicotine replacement therapies (NRTs), such as gums and patches, are designed to aid smoking cessation by satiating smokers’ nicotine cravings, but these traditional options have failed to make a significant dent in levels of addiction.